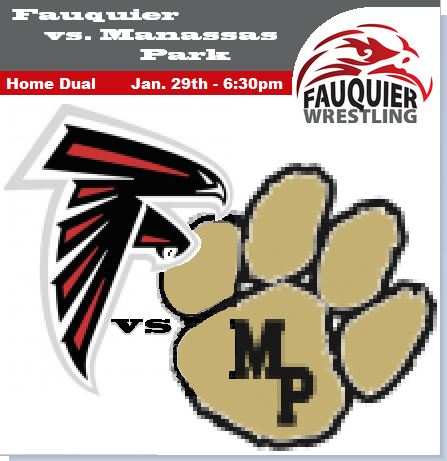 On Thursday Jan., 29th the Fauquier wrestling team hosted a home dual match with Manassas Park HS. An event that had Coach Doug Fisher re-working the schedule and adding this dual to the wrestling calendar as the weeks before brought weather related cancelations to two different wrestling events. 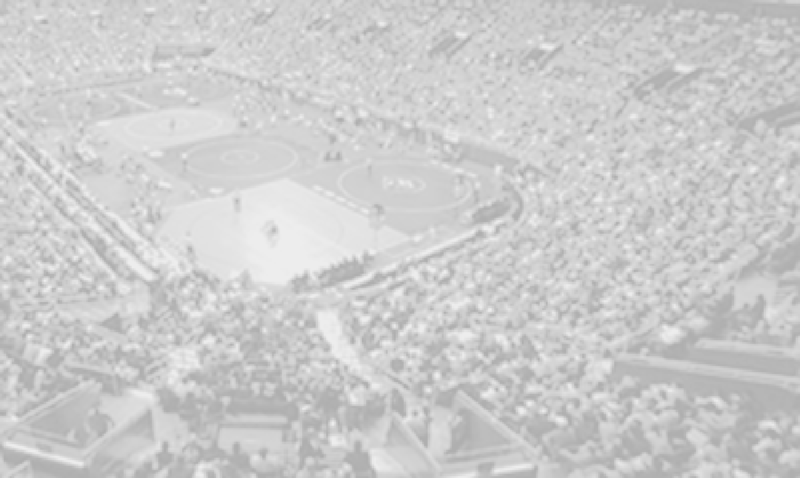 Many thanks must go to Brent Jenkins the head coach of the Manassas Park Cougar’s wrestling team for agreeing to accept this dual and traveling out to Fauquier County. An alumni and state champ from Manassas Park Jenkins also assisted the Fauquier wrestling program as an assistant coach a few years back. Jenkins is one of many former Fauquier assistants that is now a head coach of a high school team. With a single red wrestling mat down in the Fauquier auxiliary gym had the Falcons showcasing themselves to the local fans and the federation youth wrestlers. An event on this night that started with some JV matches lead into seven Falcon Seniors with Parents being recognized during this last home match of the season. Only having one senior last year called for a special celebration to honor this year’s 2015 class. This dual started with Clifford Harrison and the 170 pound weight class as he earned the win and a late 2nd period pin. The next nine Falcons that followed Harrison also recorded wins as the team ended up going 12 and 2 for the night with 6 pins and 2 forfeits. 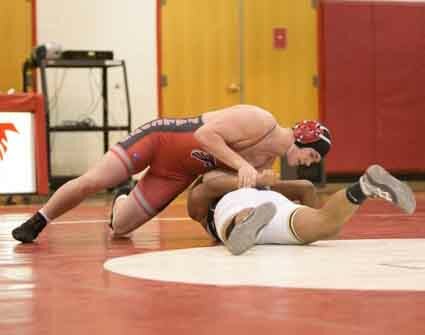 Fauquier stretched their season record to 23 wins as the home team won 63-9 over Manassas Park. Q: It looks like you bump almost your whole line-up (a weight class) and have done this often throughout the year. Can you explain the purpose of this and how the team has responded. Fisher - "Well tonight and as usual, it was about getting the right matchups. I wanted Joe DelGallo in the lineup, and we were going to be missing our 220, so I slid the entire lineup. That allowed some other good matchups at 138 Kyle Roche and 195 Eric Lemus." Q: Senior Matt Raines and Eric Lemus are two of the seven seniors that got recognized and have been a four year starter for the team – any words to explain what it’s been like coaching them and how far they have come. Fisher - "There are the only 4 year starters on the team. They started as freshmen with vastly different experience levels. Matt was an incoming middle school state champ and national team member with significant accolades and many years of wrestling experience. He had a great freshmen campaign and finished 5th in the state at 113. Eric on the other hand was much heavier, and was a first year wrestler. As we needed a body at Eric’s weight, he got thrown to the dogs early. It is a huge testament to his mental and physical toughness to not only keep grinding away in our practice room while having to practice with all older, more mature and experienced wrestlers, while also having to fight for his life during competitions. Very few make it through that kind of fire, and now only a couple years later, he is one of our most consistent producers." Below in the box score for this meet. Match Notes: Fauquier went 12-2 with 6 pins.